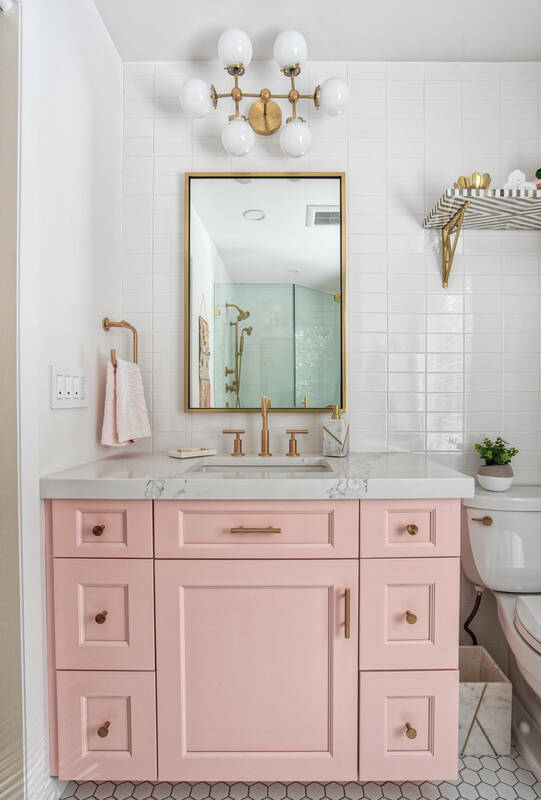 Mid Century Modern is a gorgeous interior aesthetic, and it’s worth taking cues from this style in order to give a vintage look to your bathroom. Here are 20 different ways to do it! If these look like a pain to apply, it’s because they are. But they are a quintessentially mid-century design feature and the effect looks so retro! This type of tile hasn’t been in vogue for a while, but it’s coming back with a vengeance, so you should be able to get it done in your bathroom, as well. The bathroom in this example has a very high ceiling and the tiling is done for the whole wall, so it looks like a lot. But you can also choose to only use the tiles for half a wall. It also serves as a great accent, especially if you do it in color. 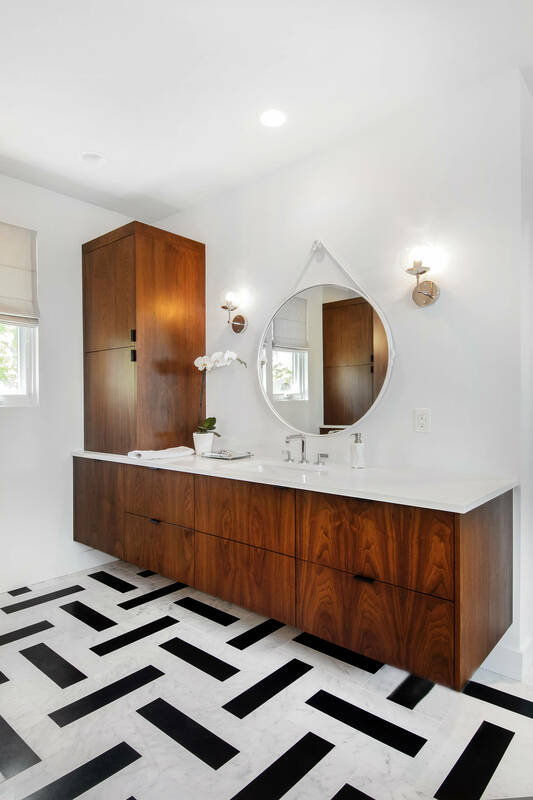 Especially when it comes to bathrooms, mid-century modern style is all about the dark wood that contrasts with the white ceramics. The effect is interesting because it adds a bit of visual interest to a space that can be very boring, chromatically. 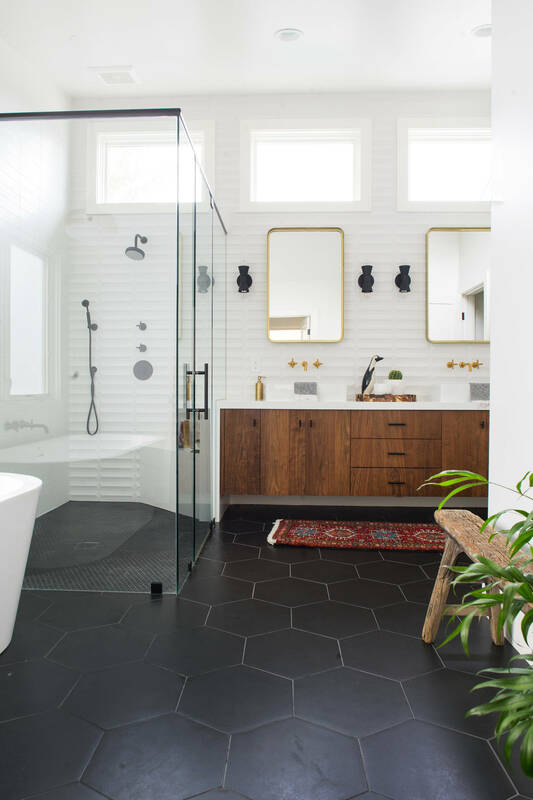 If you don’t think that color has any place in the bathroom and you’d like to keep things neutral, but not as clinical as impersonal as an all-white bathroom would be, make a bold move and go for dark wood. It’s one of the easiest ways to add a retro flair to an already existing space; there’s no need for a full remodel! Whether we’re talking about faucets, handles, or light sconces, brass is best in the 1960s. Luckily for you, slipping in brass accents into your own space should be pretty easy, because it happens to be very popular right now. In this bathroom, you’ve got the pendant lights that are made of brass and take center stage, but you can also add it in a more subtle way. There are smaller lights that are similar, or you can limit yourself to door and drawer handles, or plant hangers. One of the star colors of the mid-century modern color palette is grey. You’ve probably seen a lot of grey couches, but in the bathroom, we use it on tiles or counters. In this example, the dark grey tile contrasts beautifully with the white floor, which also has a geometric pattern that we’ll touch upon in a second. You’ll notice how this gives the space a cool, very modern vibe, almost like an updated vintage style. And speaking of monochrome geometric shapes, take a look at the visual interest created with this choice of floor tiles! If you’ve been overlooking or otherwise ignoring your floorspace, rectify that mistake by giving it a brand new face with a new pattern. That’ll allow you to keep the rest of your bathroom neutral, without it being boring. Who says light fixtures have to be boring or utilitarian? You can inject some fun even in this utilitarian space by stroking your maximalist sensibilities in whatever way you can. If you’re looking to recreate a mid-century modern style, that means light fixtures! This explosive one is so much fun and it can become the real visual draw of a space that doesn’t normally excite us very much. This playful cluster of lights makes a statement, without being impractical. This is a great way to make the bathroom the place where the party is! If you take a look at this example, you’ll notice that there is a certain simplicity to this design. The lines are all clean and geometric, and there is nothing busy about it. While patterns are certainly a part of mid-century modern design, so is simplicity, and it is this minimalism that can make the space feel timeless. Things will never be “too much” if you stick to pared down designs. Interior designers loved their neutrals in the 60s, but you don’t have to ignore brights. Pops of color are always welcome, and you can bring them into your space in whatever way you want. This example shows a bright blue accent wall, but you can also choose colorful floor tiles or even a colorful bathtub. If you’re only looking for colorful accents, something like towels can be enough to add a pop of something to break up the monotony. You’re in luck, large mirrors are just as popular now as they were in the 60s, and they look incredible in this kind of space. You can even choose a mirror in an interesting shape, like a round or hexagonal one. Aside from looking luxurious, a large mirror is ideal in the bathroom because it creates the illusion of more space, by reflecting the light and the space back into the room. Not to mention the extra space to admire yourself in! And people wonder what one does in the bathroom for an hour. If space is limited (as the room in the bathroom often is), then it’s a good idea to incorporate glass into your design. A shower made of glass or that has a glass door can open up the space tremendously. In addition, this can be a great way to showcase an accent wall, whether you choose to make it colorful or make interesting use of tiles. This is a feature you’ll see in a lot of mid-century style bathrooms, including a lot of the ones here. Undermount sinks are one of those quintessential design elements that feature in 50s and 60s bathrooms. Especially if you don’t want to ruin the elegant lines you created with your furniture, an undermount sink is an ideal solution. The alternative is a (usually square) sink that sits on top of the bathroom cabinet, which is also a popular style from this period. Ceramic decorative items are still in vogue, so you shouldn’t have any issues finding interesting pottery for your plants. Adding ceramic elements can be a great way to add a little spark to the space, especially if you want to introduce natural plants here. Otherwise, even other ceramic decorative elements would work, such as small, delicate containers (for jewelry, cotton buds, etc.) or little figurines to place on shelves. Now, if you’re really committed to that authentic mid-century modern feel, wood paneling is the way to go. This bathroom has it on the ceiling, but you can choose to apply it to the walls or go floor to ceiling if you’re bold. There are pros and cons to this one: yes, it closes up the space, but it’s also a very strong statement. It might work best if you’ve got a larger bathroom or a high ceiling. If you look at a picture of any bathroom in this style, you’ll notice one thing: drawers. You can’t miss them, the counters had a lot of drawers, and that’s what’s going to give your space a vintage vibe. They work especially well if your vanity is made out of dark wood, that is maybe even echoed in the mirror frame for a cohesive look. Do we even have to mention how practical this is? You can never have enough bathroom storage! You can keep towels, toiletries, cleaning products, etc. - out of sight, so they won’t disrupt your aesthetic. Perfect! Don’t you love it when trends come back? It makes it so easy to recreate your aspirational aesthetic. Subway tile is one of the biggest trends we’ve seen in the last few years when it comes to bathrooms and kitchens. And now, you can bring it into your mid-century modern inspired design! Subway tile can serve as the perfect neutral backdrop for more daring pieces, and even unusual colors you may want to use. In this example, it’s used in a monochrome space, with the visual interest introduced in the pattern in the floor tiles. There’s a certain glamor that’s evident from having something as seemingly decadent as two sinks and two mirrors. They are, of course, not strictly necessary, but they’re a Look, and they’re very of that era. More to the point, this set-up is endlessly practical, and maybe even romantic: no one needs to wait for the other one to brush their teeth, do their makeup, shave, etc. You can even brush your teeth or do your nightly routine in tandem, as a couple. This may just be the secret to a successful marriage: equal mirror time. You don’t really see rectangular sinks anymore, and it’s a real shame, because they contribute to a very strong look, especially when you pick out the same shape for the bathtub. You’ll notice that the sink and tub combo doesn’t match exactly, and that’s ok if you want a mix-and-match kind of quality to your space. However, there are also matching sets that you can purchase, especially with sinks that sit on top of the counter, instead of being incorporated, which is also a very mid-century feature. If you’ve been paying attention, you’ve probably noticed hexagonal shapes in these images, and that’s because they are one of the staples of this style. A beautiful design element, the honeycomb shape checks multiple boxes on the list, including the use of geometric shapes, visual interest, and unusual tiling. If that’s a bit much, you can also keep hexagons in your choice of mirrors or even the shape of your windows. Pendant lights with bold, interesting, geometric shapes are a staple of this style, so it’s a design element you’ll notice a lot on this list. Especially if you’ve got a tall ceiling to work with, this can be an excellent way to bring in that retro feel in an otherwise modern space. If you’re going to bring in colors, you might as well make them pastels; pink or green are big favorites. There is nothing more 50s Housewife than a baby pink vanity table. It’s not only feminine, but it’s authentic to the period. These are especially good choices if you’re not crazy about bold colors in this space, particularly if you’re working with a very small room - as bathrooms are wont to be. Luckily for us, designing and styling a mid-century modern bathroom is easier than it seems. A lot of these elements are popular now as well, albeit with a modern twist. You don’t have to go far to find key pieces that will help bring that authentic 50s-60s vibe to your space - it’s not about stepping into a time capsule, but about merging these designs with modern ones and making them your own. Instead, it’s about being able to successfully mix these bits of vintage-inspired decor into a contemporary space in a way that makes this utilitarian room into a stylish one with a very intentional look.